منصوریان, مهدی, جعفری نصر, محمدرضا, عطائی, آبتین. (1396). تحلیل گرمایی ـ اگزرژی برج های خنک کننده به منظور ارزیابی کارایی و بهینه سازی آن ها برای آب شیرین و آب دریا. 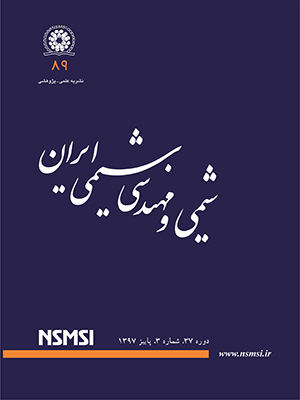 نشریه شیمی و مهندسی شیمی ایران, 36(2), 201-227. مهدی منصوریان; محمدرضا جعفری نصر; آبتین عطائی. "تحلیل گرمایی ـ اگزرژی برج های خنک کننده به منظور ارزیابی کارایی و بهینه سازی آن ها برای آب شیرین و آب دریا". نشریه شیمی و مهندسی شیمی ایران, 36, 2, 1396, 201-227. منصوریان, مهدی, جعفری نصر, محمدرضا, عطائی, آبتین. (1396). 'تحلیل گرمایی ـ اگزرژی برج های خنک کننده به منظور ارزیابی کارایی و بهینه سازی آن ها برای آب شیرین و آب دریا', نشریه شیمی و مهندسی شیمی ایران, 36(2), pp. 201-227. منصوریان, مهدی, جعفری نصر, محمدرضا, عطائی, آبتین. تحلیل گرمایی ـ اگزرژی برج های خنک کننده به منظور ارزیابی کارایی و بهینه سازی آن ها برای آب شیرین و آب دریا. نشریه شیمی و مهندسی شیمی ایران, 1396; 36(2): 201-227. این مطالعه به تحلیل گرمایی ـ اگزرژی و بررسی پارامترهای مؤثر بر کارایی برج های خنک کننده با سیال عامل آب شیرین و آب شور پرداخته است. بر اساس تعریف مدل اقتصادی هزینه های ثابت و متغیر، راندمان بهینه یک برج خنک کننده نیز تعیین شده است. این بررسی با مدل سازی یک برج خنک‌‌کننده و استفاده از داده های تجربی و ارایه یک کد برنامه نویسی شده در محیط نرم‌افزار EES انجام پذیرفته است. با توجه به کمبود منابع آب شیرین، استفاده از آب شور دریا گزینه مناسبی به نظر می آید. به همین علت در بررسی کارایی، خروجی های گوناگونی تحت تأثیر شوری های گوناگون با غلظت‌هایی از دامنه 1 g/kgتا 60 g/kg در نظر گرفته شد و تأثیر تغییرها در غلظت شوری بر روی کارایی و پارامتر های مرتبط با اگزرژی در کنار استفاده از آب شیرین مورد بررسی و مقایسه قرار گرفت. نتیجه ­ها نشان می­ دهد این تأثیر بر روی راندمان هوایی کاهشی 3 درصدی و برای راندمان آبی افزایشی 5/1 درصدی خواهد داشت. همچنین با بررسی تأثیر رسوب بر سامانه می­توان نتیجه گرفت که افزایش رسوب باعث کاهش 15 درصدی کارایی برج خنک کننده، افزایش دمای آب خروجی و افزایش حجم مورد نیاز برج می‌شود. El-Dessouky H., Al-Haddad A., Al-Juwayhel F., A Modified Analysis of Counter Flow Cooling Towers, ASME Heat Transfer Journal, 119(3): 617-626 (1997). Khan J., Yaqub M., Zubair S., Performance Characteristics of Counter Flow Wet Cooling Towers, Energy Conversion and Management, 44(13): 2073-2091 (2003). Kloppers J.C., Kröger D.G., A Critical Investigation into the Heat and Mass Transfer Analysis of Counter Flow Wet-Cooling Towers, Heat and Mass Transfer, 48(3-4): 765-777 (2005). Kloppers J.C., Kröger D.G., The Lewis Factor and Its Influence on the Performance Prediction of Wet Cooling Towers, International Journal of Thermal Science, 25: 879-884 (2005). Munangoi T., Ascapoositkul W., Wongwises S., An Exergy Analysis on the Performance of a Counter Flow Wet Cooling Tower, Applied Thermal Engineering, 27: 910-917 (2007). Ataei A., Panjeshahi M., Gharaie M., Performance Evaluation of Counter Flow Wet Cooling Towers Using Exergetic Analysis, Canadian Society for Mechanical Engineering, 32(3): 499-511 (2008). Xiaoni Q., Yongqi L., Zhenyan L., Exergy Based Performance Analysis of a Shower Cooling Tower, Journal of Mechanical Engineering, 59(4): 251-259 (2013). Wallis J., “Rising Interest in Sea-Water Cooling,” Process Cooling Magazin, 1 9 2009 [Online]. Available at: https://www.process-cooling.com/articles/85911-rising-interest-in-sea-water-cooling. Zubair S.M., Khan J.R., An Improved Design and Rating Analyses of Counter Flow Wet Cooling Towers, ASME Journal of Heat Transfer, 123(4): 770-778 (2001). Hussain I., “Performance Evaluation of Seawater Counter Flow Cooling Towers”, Master’s Thesis, King Fahd University of Petroleum and Minerals, Dhahran: ProQuest, (2011). Mrisky G.R , Monjoie M., Noble R., Research of Fouling Film Fill, “Cooling Tower Institute Annual Meeting”, Louisiana, (1993). Castro M.M., Song W.T., Pinto J.M., Minimization of Operational Costs in Cooling Water Systems, Brazilian Journal of Chemical Engineering, 17: 649-658 (2000). Perry R.H., Green D., "Perry's Chemical Engineers' Handbook", New York: McGraw Hill, (1997). Dhillon B. S., “Life Cycle Costing: Techniques, Models and Applications”, OPA, Amesterdam (1989). Simpson W.M., Sherwood T.K., Performance of Small Mechanical Draft Cooling Towers, Refrigeration Engineering, 52(6): 525-543, 574-576, (1946). Kotb A., Determination of Optimum Height for Counter Flow Cooling Tower, Asian Journal of Applied Science and Engineering, 2(2): 33-47 (2013). Jobaidur Rahman Khan S.M.Z., A Study of Fouling and Its Effects on the Performance of Counter Flow Wet Cooling Towers, Proceedings of the Institution of Mechanical Engineers Part E Journal of Process Mechanical Engineering, 218: 43-51 (2004). Braun J.E., Klein S.A., Mitchell J.W., Effectiveness Models for Cooling Towers and Cooling Coils, ASHRAE Trans, 95(2): 164-174 (1989). Jaber H., Webb R.L., Design of Cooling Towers by the Effectiveness-NTU Method, ASME Heat Transfer Journal, 111(4): 837-843 (1989). London A.L., Mason W.E., Boelter L.K., Performance Characteristics of a Mechanically Induced Draft, Counter flow, Packed Cooling Tower, ASME, 62: 41-50 (1940). Merkel F., Verdunstungskühlung, Zeitschrift des Vereins Deutscher Ingenieure, 70: 123-128 (1925). Sharqawy M.H., Lienhard V.J., Zubair S.M., On thermal Performance of Seawater Cooling Towers, ASME Journal of Engineering for Gas Turbines and Power, 133(4): 779–786 (2011). Sharqawy M.H., Lienhard V.J., Zubair S.M., Thermophysical Properties of Seawater: A Review of Existing Correlations and Data, Desalination and Water Treatment, 16: 354-380 (2010). Walker W.H., McAdams W.H., Gilliland E.R., "Principle of Chemical Engineering", 3rd ed., New York: McGraw-Hill inc, (1923). منصوریان، مهدی؛ تحلیل حرارتی و اگزرژی برج های خنک کننده به منظور ارزیابی کارایی و بهینه سازی آنها برای آب شیرین و آب دریا، کارشناسی ارشد، دانشگاه آزاد اسلامی واحد علوم و تحقیقات تهران، (1394).